what does it mean to be dave? that used to be a difficult question for me. there was a point in my life when i considered changing my name; i felt too common, not distinct enough. i often looked for ways to make myself stand out, to find a way to break free of the mold. as i grew, i realized who i really was; who we really are. i am dave. i grew up as dave, i will die as dave. what does it mean to be dave? it means being part of a huge circle. there are literally thousands of us. everybody seems to be related to one, or at least knows one or two. i used to fear being generic, until i realized we aren’t generic at all. we are all different, yet we all have one fantastic thing in common. dave has been one of the most common names for generations and it is time for it to be celebrated. our parents did us a great service by choosing our name so wisely. i doubt that they had any idea that they were bonding us with so many others simply based on what we are called. but here we are. and it is time for the world to recognize the fact, as we have. 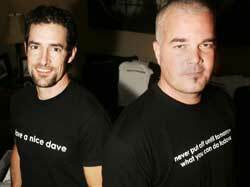 we’re daves, and they’re not. they’re just jealous because they’re not us.